A. Raw Materials: meat (poultry, beef, mutton, pork, etc. ), seafood (fish, shrimp, etc. ), vegetable (potato, pumpkin, lima-bean, etc. ), cheese or the mixture of these materials. B. Products: hamburger patty, chicken nuggets, chicken or beef steak, pumpkin or potato patty. Different shapes of meat patty such as round meat patty, square meat patty, tri-angle meat patty, etc. by changing different molds. C. Capacity: 100 kg/h. We can customize for other capacities. 1. 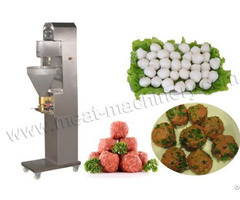 AMS-PATTY100-III Automatic Meat Patty Machine is suitable for all kinds of meat stuffing. It can produce various sizes of meat patty by changing the size of the forming mouth. 2. 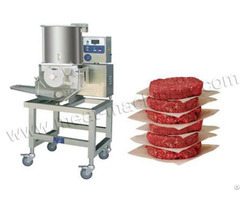 AMS-NJJ200-II Starching Machine can be used with the automatic meat patty machine or can work individually. It is mainly used to starching the products before they are fried. The main purpose of starching is seasoning and providing adhesive for the subsequent breading. 3. 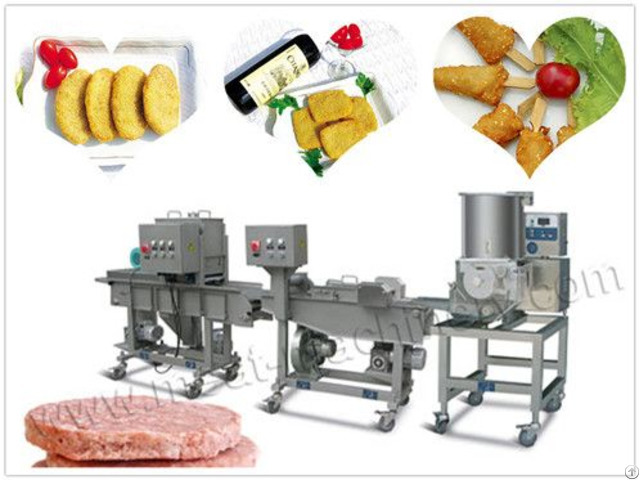 AMS-SXJ200-II Crumb Breading Machine is used to breading the hamburger meat patty, Chicken MC. Nuggets, potato pie, pumpkin pie and skewering kebabs, and so on. 4. AMS-SFJ200-II Powdering Machine can be used with the starching machine, breading machine to compose production line for producing different products. 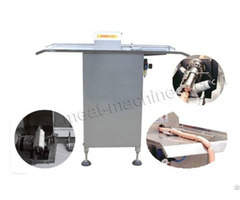 Note: If your meat material is not the ready meat stuffing, the ancillary equipment is needed to equipped with our Mini Meat Patty Production Line, such as meat cutter, meat grinder/chopper, and meat stuffing mixer, etc. Our company can supply all these machines of high-quality and low price. You are welcome to see the detailed information about these machines on our website. 1. All machines are made of high-quality stainless steel and NSF materials, wear-resistant and durable. 2. It is in line with the food hygiene standards, safe and healthy. 3. It is fully automatic, easy to operation and easy to clean. 4. The meat patty is with uniform size and good taste. II. With decades of experience and adept skill, strictly trained salesmen can show hidden profits in your meat processing business. III. A quality process which meets the requirements of international quality system standards has been defined to ensure the effective implementation of Quality Policy. IV. We continuously improve machine quality and service through final installation and use by the customer as well as effective feedback and timely corrective actions. V. Maximum customer Return On Investment is our ultimate aim; glade to provide cost and performance benefit to the customer in the execution of designing a meat processing plant layout.